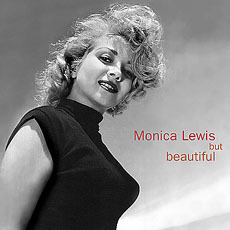 Monica Lewis (born May 5 1925) is an American singer and actress. She started her career as a radio personality and vocalist in New York City and quickly signed to Decca and later Capitol Records, recording hit renditions of songs like "Autumn Leaves," "People Will Say We're in Love," and "A Tree in the Meadow." Lewis also appeared in the very first episode of The Ed Sullivan Show, in its initial run as Toast of the Town and recorded the voice of Chiquita Brands International's Chiquita Banana between 1953 and 1967. Contracted to MGM, she had a brief film career in the 1950s, starring in a series of ill-received musicals. Lewis was married to film producer Jennings Lang from 1956 through his death in 1996, with whom she had three children. Her marriage to Lang afforded her a number of supporting roles and cameos in disaster films of the 1970s, including roles in the Lang-produced disaster films, Earthquake, Airport '77, Rollercoaster and The Concorde: Airport '79.